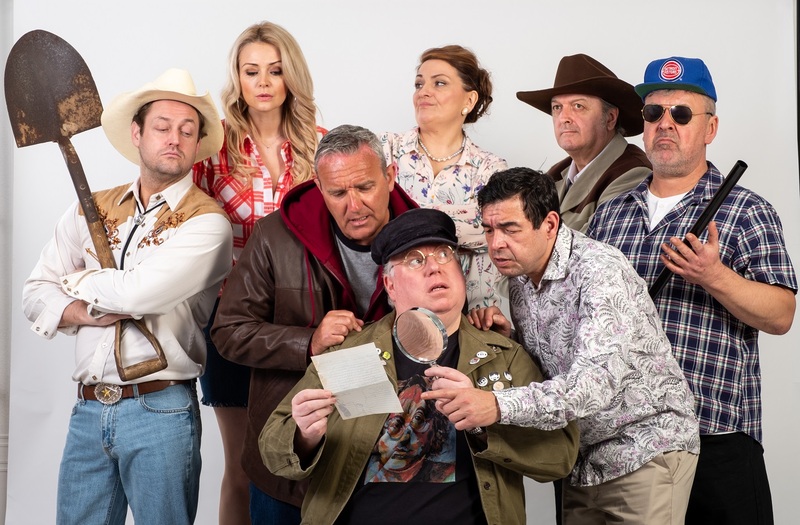 New stage comedy Lennon’s Banjo makes its world stage premiere in Liverpool in less than two weeks – and rehearsals are well underway for curtain up at the Epstein Theatre on Tuesday 24 April. The all-star cast have been locked away in rehearsals as they prepare for the show. Excitement is mounting and the countdown is now on until audiences take their seats for this hotly anticipated comedy which tells the fascinating story of John Lennon’s missing banjo which is now worth millions to whoever finds it. Lennon’s Banjo runs at the Epstein Theatre from Tuesday 24 April, continuing through to Saturday 5 May. Tickets are already selling fast! The eight-strong line-up took a break from their busy rehearsal schedule for some real Liverpool fun and frolics aboard the world-famous Magical Mystery Tour bus, taking in the sights and sounds of the city. Cast members Eric Potts, Mark Moraghan, Jake Abraham, Lynn Francis, Danny O’Brien, Stephanie Dooley, Alan Stocks, and Roy Carruthers were joined by The Beatles original drummer Pete Best to officially launch the show. Pete Best will make his stage acting debut when he plays himself during three special performances during the two-week run. Pete’s shows are the 2.30pm matinee and 7.30pm performance on Wednesday 25 April, and the 7.30pm show on Saturday 5 May. Alan Stocks will portray Pete Best in all other performances. The evening performance on 25 April is sold out. Lennon’s Banjo is set in present day Liverpool. The quest is on to find the holy grail of pop memorabilia – the missing banjo on which John Lennon was first taught to play music by his mother Julia Lennon, who first introduced the youngster to rock and roll. In an attempt to get his hands on the letter and the clues, he persuades his wife Cheryl (Stephanie Dooley) to befriend the hapless tour guide and win his affections. The race to find Lennon’s Banjo is on! Lennon’s Banjo is based on the 2012 novel Julia’s Banjo written by Rob Fennah and Helen A Jones. The play is produced by Rob Fennah and Pulse Records Ltd in association with Bill Elms and directed by Mark Heller. The race to find the holy grail of pop memorabilia is on! The Salvation Army’s Strawberry Field project is the official charity partner of Lennon’s Banjo.